As you age, your skin begins to tell a story—lazy summer days spent out in the sun, the trying times of puberty, each and every time your smile reached your eyes. Even significant weight gain or weight loss can write its own chapter. Without a doubt, your skin can be the physical evidence of a life well-lived. But these changes to your skin are not always favorable. Fortunately, textural irregularities like wrinkles, acne scars, freckles and sunspots, and cellulite can all be corrected with skin rejuvenation. These processes are intended to improve the appearance of your skin, including skin care products, treatments, and in-office procedures. The goal of all of skin rejuvenation is to reveal younger, smoother skin. One of the most common examples of skin rejuvenation is skin resurfacing, a method that refers to any treatment or procedure that will physically remove the top layer of skin. The goal of resurfacing is to remove damage cells on the skin’s surface with different techniques, including lasers, light treatments, and acids. These different methods will vary in invasiveness with some requiring significant downtime to recover. Chemical peels use a variety of different chemical formulas that can be use on your entire face or just certain areas for a specific length of time. The chemical solution is applied to your skin and will cause it to exfoliate and eventually peel off. The new skin is smoother and less wrinkled. Depending on the type of chemically, recovery could take a few weeks. Dermabrasion is another way injuring skin in a controlled way, but this method uses an abrasive and not chemicals. A rapidly revolving tool is used to remove and level the top layers of your skin. The injured skin will begin to bleed, but new skin will grow to take its place. Recovery time is determined by how many layers of skin were removed, or how “deep” the procedure went. 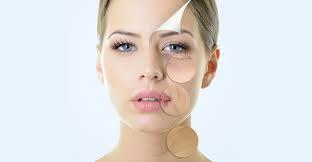 Laser resurfacing uses light and heat energy to “destroy” thin sections of skin. The laser will remove the top layer of skin while heating the underlying layers. This stimulates the growth of new collagen fibers, resulting in new skin growth that is much smoother. One of the benefits of laser resurfacing is that it causes little damage to the surrounding skin, making it ideal to use in sensitive areas. Depending on the type of laser used, recovery could be a few days to a few weeks.